It may seem like March is a long way off, but the 2019 Trade Show is just around the corner and we’re ramping up for the upcoming SX season. The Trade Show is without a doubt our favorite exhibition — we know we’ll have fun. But we want to share some things to keep in mind so you can make the most of your experience, whether you’re attending or exhibiting. Put a good amount of thought and effort into the design of your booth. One of the primary reasons you’re at the Trade Show is to gain exposure with our diverse crowds, so be creative and find ways to stand out! An open, welcoming space with engaging activities and ample opportunities for product knowledge is a great place to start. A well-designed setup can make all the difference in getting people talking about your presence at SXSW. Promote with merch! Everyone and their mother loves free merch, so bring plenty to share with the rest of us. T-shirts, headphones, coffee mugs, lanyards, etc., are popular items but try to think outside the box with your giveaways and create a buzz. Get people excited to swing by. Take advantage of our Exhibitor Lounges. They’re private, exclusive areas for exhibitors to take breaks, catch up on emails, organize leads, or recharge with a cup of coffee. In 2018, some of our fastest growing areas on the show floor were augmented and virtual reality, lifestyle tech, wellness, and international delegations. Each year we always find new and exciting innovations and trends that blow us away and keep us talking all year. Visit as many booths as you can and see for yourself! 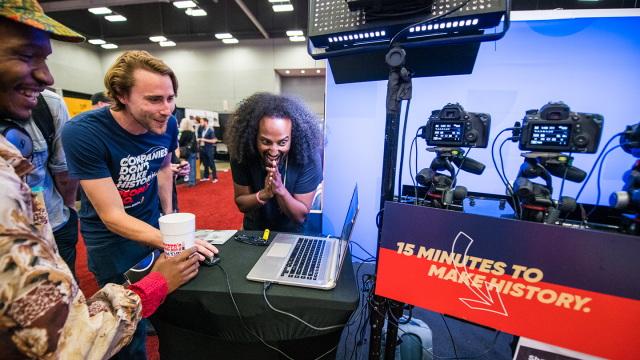 We’re anticipating more than 400 exhibitors in 2019, so check the SXSW Go app to make your plan for exploring the Trade Show floor. Discover something new. There are plenty of opportunities to branch out of your comfort zone or interests. The Trade Show has an extremely diverse range of businesses from all industries and sectors, including health and medtech, marketing, music and film equipment, robotics, aerospace, mobile apps, 3D printing, and more. Stop by a booth you might not otherwise check out and walk away with a new perspective (and perhaps some free merch). Participate in demos on the show floor. The tech, VR, and gadgets at SXSW aren’t always display-only. Venture around the show floor — you’re sure to find some exciting interactive booths where participation is encouraged. Network — one of the biggest reasons people come to SXSW is for the unparalleled opportunities to make valuable, genuine connections, so take advantage! Bring business cards, don’t be shy, and talk to as many people as you can. Whether you’re a business looking to add dynamic thinkers to your organization or a professional looking to join an elite company, the Job Market is the perfect place to help meet your goals. Swing by the Meet Up Pavilion for some casual networking with other professionals and explore a range of topics from the Interactive, Film, and Music industries. Most of all, enjoy yourself. Pay attention to SX social media to keep up with daily trends, exciting booths, and buzz at SXSW. You never know who is going to blow the crowd away this year.